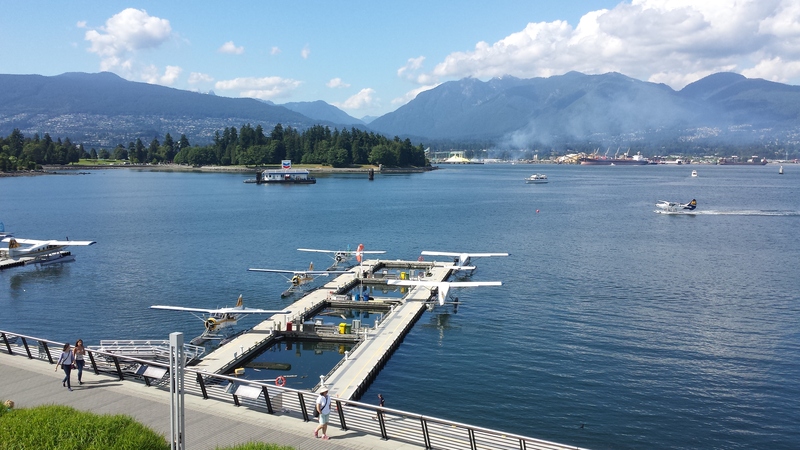 Vancouver makes me sad only because it was a everything I love about cities, rolled into one and I couldn’t stay. There were metros and beaches and runners and bikers and markets and fresh fish and blue skies and mountains and 70 weather with no humidity and boats and Tim Horton’s on every corner and bars and parks and kayakers and paddle boarding and dogs and dog beaches and shopping….shall I continue? I was not happy about leaving. 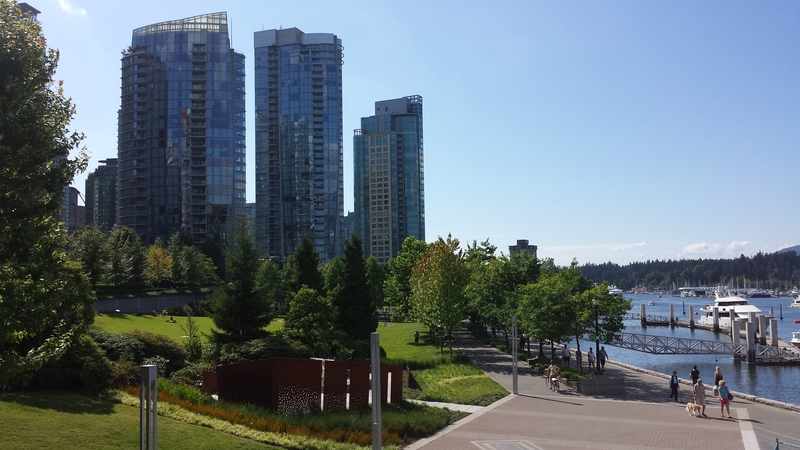 Arriving in the city, we quickly made it to our hotel in the posh, yuppy district of Coal Harbour. A complete 180 from the roach motel we stayed in the night before. We immediately dropped our luggage and headed out for a walk along the harbor. City view on one side, Vancouver Bay and mountains on the other. Perfect. 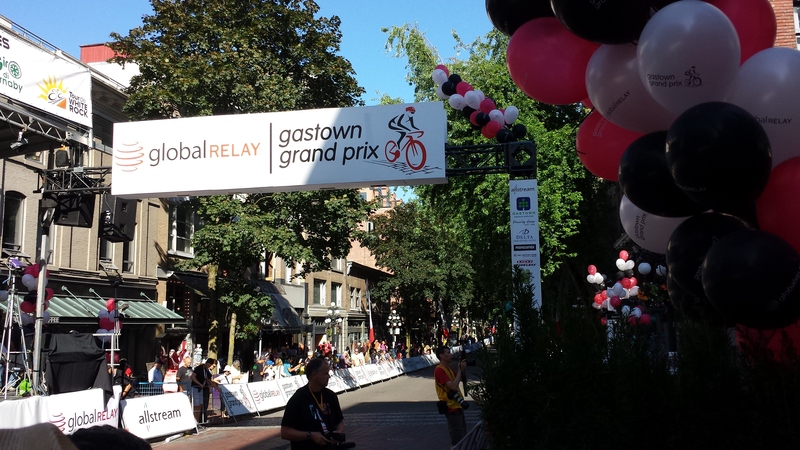 From there we stumbled into a quaint little area called Gastown where a bike race was going on. The neighborhood was packed with spectators and we parked ourselves at a bar for a while to watch. After boredom of watching bikes circle and circle, we ventured off to the most unimpressive Chinatown I’ve ever been into. Then, we ate at the worst restaurant we’ve ever ate in, something that’s become a bit of a first meal in a new city tradition. Disgusted, we walked back to the hotel through an area where I’m pretty sure I saw about 5 people who were completely high on bath salts. Strangely enough, it was just a couple blocks from our posh digs. I turned my engagement ring around and made a mental note to avoid this area. The next day we used a Groupon for a Hop on Hop off bus or a HOHO, which is way more fun to say. I’ve never done on of those before and I think it’s a great thing for people who are old or have kids. We are totally fine taking the subway and paying a few dollars for the challenge of navigating a city. For $20, the HOHO is pretty pricey for able body people. We spent most of the day at Granville Island strolling the market and grazing on fruits, veggies, cheese, bread and desserts. Then we finished the HOHO tour and walked through the gay neighborhood of Davie and the cities most expensive neighborhood of West End. All of this was followed by an indulgent sushi dinner. I was falling hard for Vancouver. 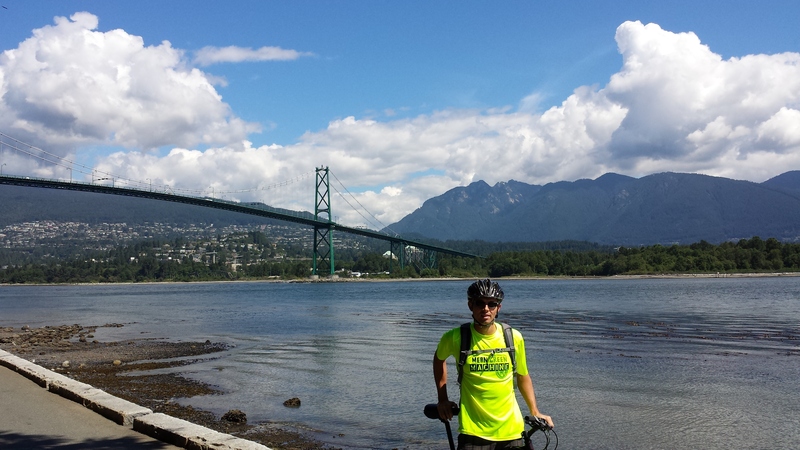 One of my favorite days was spent riding bikes through all the neighborhoods in the city and Stanley Park. We stopped to eat and drink often and I wondered if this is what it would be like if we lived here. Probably. The last day was spent taking a boat and bus to Grouse Mountain to do the famous, Grouse Grind or as the locals call it, The Grind. 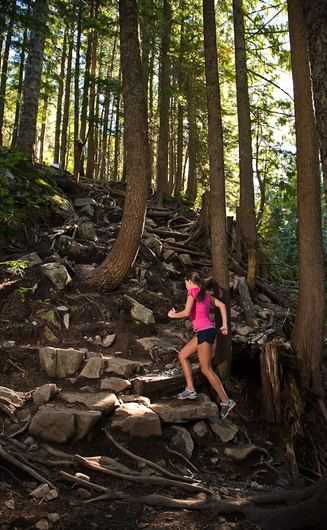 This is a 1.8 mile trail up the face of Grouse Mountain. 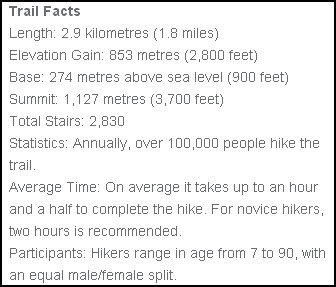 The Grind’s website says, “This trail is very challenging. Keep in mind that there is a wide range of mountaintop trails that might better suit the average hiker.” Are we average hikers? I wanted to find out. So, I’m happy to report that based on the results of our hike, I’m a little more in shape than the average bear. As for Fabien, I’m having him tested for performance enhancing drugs. 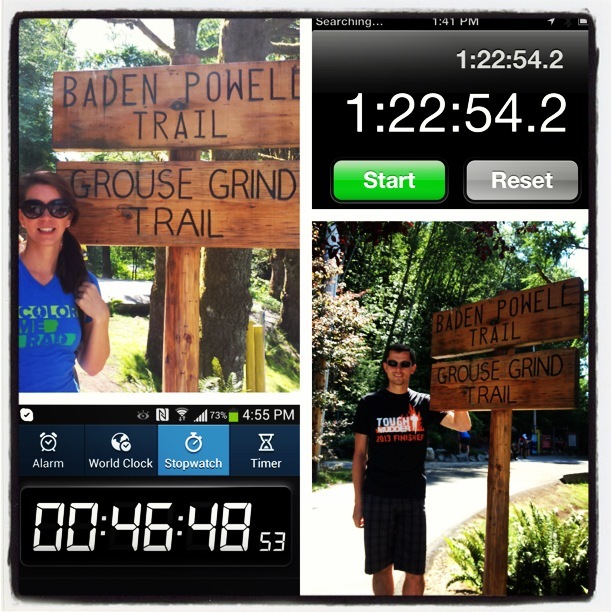 The Grouse Grind is no joke! I’m not gonna lie – it was hard. At some point, my legs were shaking so bad, I had to stop. Not to mention I was profusely sweating. However, I was doing a lot better than 90% of the people on the trail. I was pretty sure a few people were going to need a helicopter rescue. Then there were the super humans. Women and men who ran past me. One man I talked to for a while said he does it every day. You can actually get a chip that will keep your stats and compare you to the other climbers. If we lived in Vancouver, we would definitely be doing this regularly. It was an amazing workout. After a big, rewarding lunch and shower, we finished off our Vancouver adventure at a music festival followed by a yummy seafood dinner. We took the bus back to our neighborhood and it stopped in the sketchy area a few blocks from our hotel. Again, the druggies. Our flight home was at 7am and we woke up early to head to the airport. I flipped on the news and saw the report that Cory Monteith, one of the stars of Glee, over dosed on drugs in Vancouver, at the Pacific Rim hotel, which was on the very same block as our hotel. We walked passed the scene on the way to the metro and it was eerily quiet. Strangely, there were no reporters or fans yet. I’m not a fan of the show, but, of course, it’s really sad thing. Had we passed him getting off the bus when we walked through the sketchy area? Maybe. Moral of the story, say no to drugs, kids. I returned to Nashville bummed. I don’t want to hate on my city, but Vancouver is everything I love about big cities and traveling. <Insert sad face here> To check out all our photos of Canada, click here. And to read about our trip in the Rockies, click here.